View game-by-game results for the selected year. There are scores for every game the team has played (1000+) over more than 100 seasons! 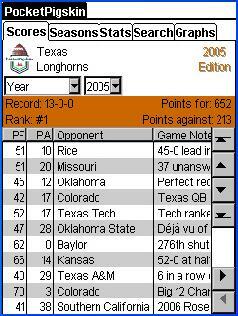 The summary section of the screen shows the record, ranking for the season, total points for, and total points against. Track game results by editing the points for (PF), points against (PA), and adding notes. View game results for head-to-head competition. 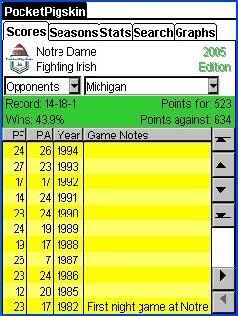 Select a rival team to view each game in the history of the series, with summary statistics for the record (wins-losses-ties), winning percentage, and total points for and against. 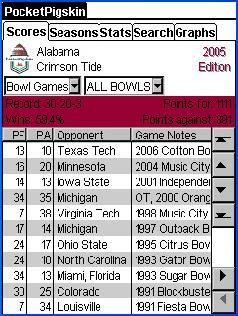 View bowl game results, including summary statistics for the record, win percentage, and total points for and against.